Archaeologists often struggle with the challenge of linking historic-period artifact assemblages with specific communities. In particular, small home sites discovered on historic plantations are often difficult to identify as an African American or white tenant house since the material culture appears similar. The discipline also struggles with how to identify the expression of specific West African cultures in their archaeological assemblages. Here, we discuss how DNA was successfully extracted and analyzed from a clay tobacco pipe stem collected from an African American slave quarter in Maryland, USA, and what this information can and cannot reveal about the people present at the site. 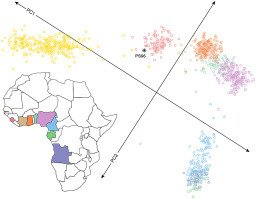 We successfully identified DNA from a woman, and genome-wide analyses revealed she was closely related to Mende living in present-day Sierra Leone, West Africa. The ability to recover genetic data from personal artifacts now provides archaeologists a viable tool to address questions about communities and ancestral origins. Furthermore, these findings hold the potential to connect living descendants with their ancestors’ homes.